Hair is an important part of our body and plays an important role in making or breaking one’s personality. In Leeds, hair loss is a major problem these days and to get rid of this problem FUT hair transplant is a permanent solution. FUT stands for Follicular Unit Transplantation that is a process in which hair is transplanted from the permanent part to the targeted area. FUT is done with the help of anaesthesia that involves the technique of extracting the hair root groups under a microscope. It is the most common method for transplanting hair. FUT hair transplant is a procedure in which clusters of hairs also known as follicular units are removed from the donor area and inserted into the recipient area. These clusters of hairs are naturally occurring units that if transplanted well, will replicate the natural growth of hair in the recipient area. But it takes a great deal of skill and experience on part of the surgeon that is acquired only after years of practice in the field. To determine good candidates for FUT hair transplant is someone who is healthy and has no absolute contraindications to the treatment and has no family history of severe pattern baldness. The ideal age for this transplant is mid thirties for both men and women alike. Younger people below 24 years of age or people suffering from multiple medical conditions such as heart problems, diabetes or hypertension should not opt for FUT hair transplant. Apart from it, the reason for hair fall also needs to be identified to assess the candidacy of a person. Doctor may suggest using Minoxidil, Rogaine or Finasteride after the FUT hair transplant. The main benefit of FUT is the quality of hair that is extracted and harvested. This transplant is suitable for men who are suffering from different types of hair loss such as male pattern baldness, etc. Women who suffer from balding in the front or suffering from hair thinning issues can opt for FUT hair transplant that is a safe and effective procedure. FUT hair transplant add density to the balding areas and provide undetectable results. Nu Hair Clinic offers special hair transplant surgeons and highly skilled team of technician in implanting hairs. Before the transplantation we provide free consultation with the surgeon so that you can get an idea about the procedure and the end result. 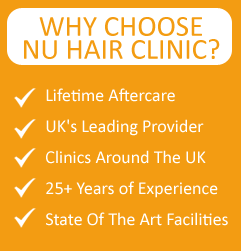 Nu Hair Clinic is considered to be one of the best clinics because we have a list of satisfied customers in Leeds. The facilities and techniques we use in providing the treatment is state-of-the-art and effective. Our patient is our top priority and we take care of them with the help of our team of professionals. At Nu Hair Clinic, we provide various surgical and non-surgical procedures to treat hair loss such as PRP, mesotherapy, FUE and FUT hair transplant and others. If you are on a budget then don’t worry as these therapies are affordable as well.